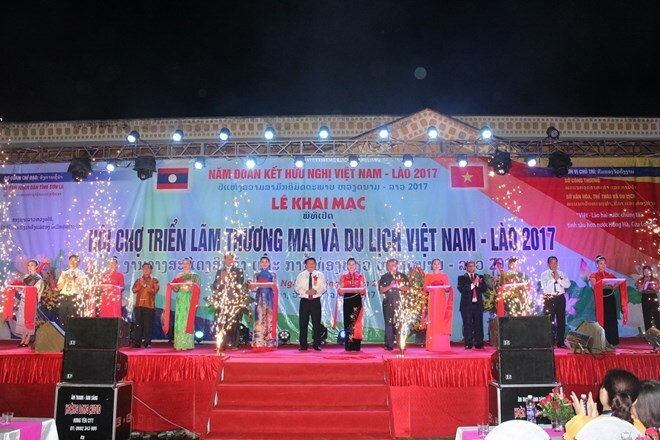 Son La (VNA) – The Vietnam-Laos trade and tourism fair opened in Moc Chau district, the northern province of Son La on August 29 as part of the Moc Chau ethnic cultural festival in 2017. The week-long fair is billed as a significant political, economic and social event to promote people-to-people exchange and friendship between Son La province and Laos’s northern localities. It also creates opportunities for enterprises from both sides to seek business potential and partners as well as enlarge trade relations. The fair features over 140 booths displaying staples of domestic businesses and those from Houaphanh and Luang Prabang provinces. Particularly, two booths are arranged to popularise Son La’s culture and tourism products. In a bid to ensure safety for the fair, Moc Chau district has asked relevant authorities to promote security, prevent fires and explosion as well as increase environmental hygiene. Moc Chau Plateau is the largest of its kind in the country, with an average altitude of 1,050 metres. The area has a temperate and fresh climate all year round with many beautiful spots and historical relics.